CGIAR is moving to a different model of doing science, and this needs to be well thought out and understood by centres, CRP researchers and partners. The focus can no longer be on research deliverables such as reports, trainings, crop varieties and decision support tools. We have learnt that the production of these deliverables doesn’t automatically lead to impact in terms of the wellbeing of smallholder famers, the end users of our research.This series of Climate Change and Social Learning (CCSL) briefs will focus on lessons learnt from the ongoing CCAFS experience with TOC. 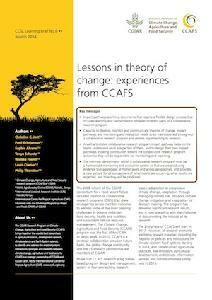 The objective is to share experiences in real time, and generate discussion that will help CCAFS and others improve their TOC, impact pathways and M+E.